Remember the beginning of this season? When the Yankees were still a year away from contending, Andrew Benitendi looked like a sure thing for AL Rookie of the Year, and Aaron Hicks looked like he might beat out Aaron Judge for the last spot in the Bronx outfield? 9,151 feet of home runs later (yes, math nerds, that’s over a mile and a half), Aaron Judge has become the must-see baseball stud of 2017, and an early favorite for AL MVP. And the legend is only growing. Just look at this weekend against the Orioles, where Judge went 7-12 with 8 runs, 6 RBIs, and 3 homers including a titanic 496 foot monster that cleared the bleachers in left center. As of Tuesday morning, Judge leads the American League in batting average (.347) and home runs (22), and is just one RBI behind Nelson Cruz. The last time a rookie won the batting triple crown? That would be never. But it isn’t even Judge’s stats, as impressive as they are. We are enthralled with Aaron Judge because in the entire history of baseball, we have never seen anyone like him. We’ve seen great rookie seasons. Ted Williams hit .327 and led the league with 145 RBI in his rookie season in 1939. Ichiro won the 2001 MVP and the batting title in the heart of baseball’s steroids era. And recently, Mike Trout burst onto the scene in 2012 by compiling 10.8 WAR, and would have won the AL MVP if Miguel Cabrera hadn’t won the triple crown himself. Judge’s prestige is undoubtedly buoyed by his presence on the New York Yankees, arguably the most well-known baseball team in the world. Just how popular is he there? Yankee Stadium has already christened “The Judge’s Chambers,” in honor of the stud rookie. Even Jeter didn’t get his own section in the House that Ruth Built. 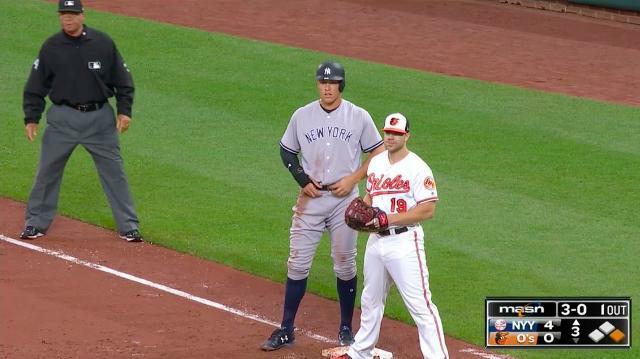 Judge is a giant, standing on the shoulders of giants. But the legend of Aaron Judge is all his own making. Each plate appearance leaves us on the edge of our seat as we wait to hear the thunderous crack of the bat that signals another Judge monstrosity. Sometimes we’re left disappointed with a strikeout–that’s baseball, after all–but more often than not Judge leaves us in awe with a blistering line drive or a sky-scraper that takes an eternity to drop beyond the outfield fences. “Awesome” is an overused word, describing the most mundane things in our lives. How many of those things truly leave us agape, awed, and inspired? Thus far this season, Aaron Judge has been awesome. Every TV screen, every concessions stand, every scoreboard he hits only cements his growing presence in the lore of Major League Baseball. Can Judge keep this pace up? Conventional wisdom says he has to regress to the mean at some point. He was a great player in the minor leagues, but no one saw this historic rise coming. Eventually Judge will fall back to earth…right? Probably. But don’t legends find ways to do the impossible?